Last weekend- courtesy of the lovely Accedemia Italiana- my roommates and I were bussed off to the beautiful Siena and the completely unpronounceable San Gianmango. (There’s a reason this isn't a YouTube channel). 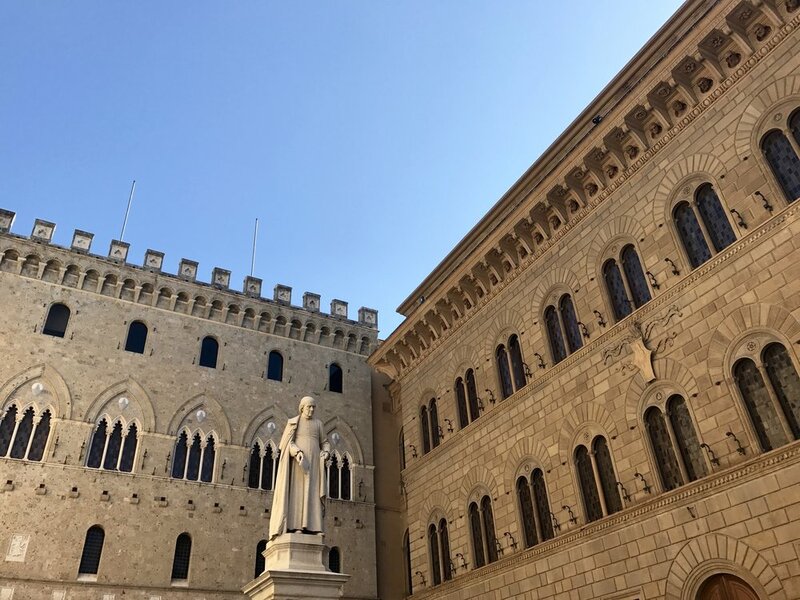 Our school supplied us with the opportunity to see both small cities in one day- which means one outfit saw more of the Tuscan country side than I ever dreamed I would. The entire trip was a real life fairytale; and not just because I had to pinch myself awake the entire two hour bus ride (no sleeping when the roadside resembles the opening scene from the sound of music). If I could adopt-a-highway in Italy, this would be it. Below my favorite parts of our little day trip, most of which consist of food. Are we surprised. Siena is a wonderland. The entire town feels like it has an Instagram filter over it, and it wasn't just my sunglasses. The actual word for Sepia- the dye- comes from the natural clay found in the area surrounding Siena. The city is also home to St. Katherine's skull which we had the (fortune? misfortune?) of seeing in person. The real draw of Siena for many, however, is the bi-annual horse race. The neighborhoods, although very close together, physically, are very divided socially. Each of the seventeen communities has their own mascot, flag and, of course, horse in the race. The actual event takes place in Sienna's main square- our setting for mid-day gelato- and the winner is held in high regard. My personal favorite part of our few hours in Siena (besides the food?) was the Duomo of Siena. The floors, which are only uncovered only six weeks out of the year to preserve them, were in full display at the time of our visit. The ceiling was lit up with metallic stars and the walls covered in delicate marble. Stepping into the Cathedral's interior transports you to a sort of spiritual Candy Land while the facade looks 100% edible. It's filled with unimaginable treasures; works of Pisano, Michelangelo, Donatello and Bernini just to name a few. In a single word- magical. San Gianmango is- and I'm going to be honest here- totally swarmed with tourists. It's breathtaking, tiny and absolutely charming, but while you expect hoards bus-tours at Sienna, it was a rather jarring surprise at this quaint mountain town. Then again, we must remember that I was very much a part of an undeniably American and probably invasive tour bus myself, so my overall emotion is inevitably one of gratitude for the opportunity to even see this medieval gem. Only about forty-five minutes from florence by car, San Gianmango is famous for it's pottery, painting and pici pasta, all of which we made sure to check out. 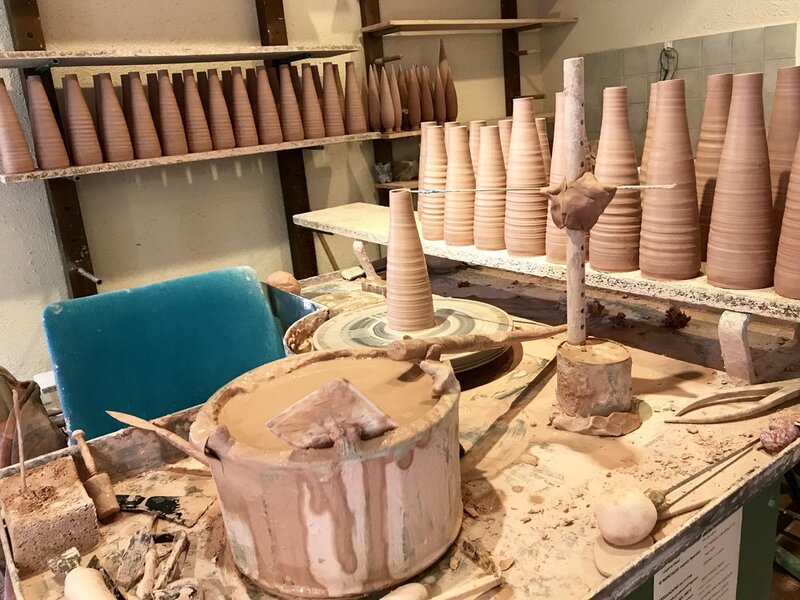 We found hidden ceramic workshops and tucked-away olive groves along with excruciatingly high lookouts over the Tuscan countryside. San Gianmango was very worth the trip. Thanks for making it through this post and I hope you also got to eat pici pasta last weekend. More to come soon! Ciao!